Comin’ through, comin’ through. . .
From Gettysburg, witness the distressing phenomenon of automobiles colliding with monuments. Gettysburg Daily notes that in this particular instance, the road in question sees a lot of non-visitor traffic. I’d imagine that most folks who are seeing the field from their car are moving pretty slowly, and you’d assume that anybody who managed to knock a stone marker perpendicular to its axis of placement would have to be moving along at a pretty good clip. Then again, you’d be surprised what cars can do with relatively little brute force. Here’s a statue of Lincoln that stands at the entrance to my alma mater. A friend of mine slid right into this thing while turning into campus on an icy morning. He was driving a small sports car and wasn’t going particularly fast, but he still shoved both Abe and the solid base on which he stood off-kilter. It took a crane to set the Great Emancipator back into position. Several thousand John Wilkes Booth references later, we let him live this one down. Anyway, this kind of vehicular monumentcide highlights one of the ironies of historic preservation. By making sites accessible to visitors, we also expose these sites to the wear-and-tear or even outright damage those visitors might inflict. Knoxville historian Jack Neely revisits a venerable frontier tradition—conspiracy to commit treason. Here in East Tennessee, two of our founders flirted with European powers on separate occasions, one of whom did so while participating in an illegal statehood movement. I think Neely’s piece is the first one I’ve read that tries to find some link between the early separatist schemes in American history. The fact that these guys came into their own at a time when the federal government was still congealing is very suggestive. Sending out feelers to a foreign power probably didn’t have the psychological ramifications that it does now, when U.S. sovereignty is more of a given. In the case of the Blount and Wilkinson conspiracies, most accounts that I’ve read stress the agency of particularly ambitious and unscrupulous actors who were looking out for number one. The best and most thorough study of the Franklin movement also emphasizes the leadership of regional elites and land-hungry men of means. Many of these schemers no doubt acted out of motives that were (to put it charitably) something other than altruistic, but I think the support and approval they received from large numbers of frontier inhabitants is important, and we shouldn’t overlook it. The leading Franklinites may have been ambitious bigwigs, but to your run-of-the-mill frontiersman the Franklin movement still offered possible solutions to the problems of distant and unresponsive state and federal governments and threats to the ability to navigate the Mississippi. And even Blount, acting on his own behalf rather than as part of a larger protest, remained wildly popular back in Tennessee, which indicates that these Revolutionary-era plots may have been more attuned to the needs and beliefs of frontier inhabitants than we might assume by looking at their sometimes self-interested architects. We still don’t know enough—or at least I don’t know enough—about the common frontiersman of the late eighteenth century. He’s an elusive figure, but I suspect that we’d all be surprised at how much of his worldview we could recover. …now include exposure to radioactive material. Suddenly I don’t feel so bad about eyestrain from microfilm readers. I’ve done quite a few posts on Glenn Beck’s crackpot historical forays, but I haven’t written many at all on the ways that folks on the other end of the political spectrum have misinterpreted or misappropriated the past. The problem is simply that I’ve had a harder time finding examples of bad history coming from the Left. I mentioned this to a friend of mine as we headed to lunch yesterday. I noted that readers might start to suspect I’m a flaming liberal if I didn’t take the Left to task for some historical transgression or another. It was a very general remark, but he had a point. I certainly don’t think that people on the Right are more interested in history than those on the Left. Academic historians are famous for being predominantly liberal. I do think, however, that the Right probably finds the past more useful than the Left does simply because of the differences in their respective rhetorical positions. Conservative rhetoric invokes the past because conservatism often claims to be a restorative ideology. We must get back to the Constitution, back to the principles of the Founding, back to the Puritans’ godly city on a hill. Liberalism, by contrast, portrays itself as the political system of possibility. Liberalism clamors to use whatever means are at our disposal to slay the social and economic dragons that have menaced us for so long. Given these contrasting postures, it’s natural that conservatism would invoke the past with more frequency, or at least with more affection. I have no desire to offer my own views here as to which vision is correct, but it’s worth asking if one or the other is more congenial to an understanding of the past. Personally, I find both visions lacking when it comes to a sense of history, though for different reasons. Part of the problem with the Right’s restorative use of history is that it neglects the past’s otherness. When we identify with the past too readily, when we urge the nation to get back to the good old days (whenever those were), we can forget that those days weren’t ours, and that those people weren’t us. They offer lessons and examples, but the analogy will never be exact. This is particularly true when it comes to the Founding. Those men and that era created the language we use to express our own ideals, so we can find them sounding remarkably like us. Occasionally, though, they use that language and those ideals within a context that gives them a very different meaning, one we wouldn’t recognize. Of course, in describing both positions, I’m committing a fallacy of my own—drastic over-simplification. It’s hard to speak briefly about political philosophies without broad generalization, and the risk is that you’ll reduce these ideologies to caricatures. I’ve probably done so here. Still, I think the larger lesson here is valid. The past proves difficult to shoehorn into any particular philosophy, because when we’re talking about the past, what we’re really talking about is reality in all its complexity and ambiguity. The study of history should serve to regulate our abstractions and philosophies by reminding us all that our opinions about the way we think things are must come to terms with the way they have actually been. …that looks worth keeping an eye on. It’s called Historical Digression, and it’s maintained by the director of a historical society who was kind enough to stop by this site and leave a comment. Check it out. I’ve never been a fan of John Hagee, the bombastic pastor of San Antonio’s Cornerstone Church. I find his theology bizarre and his sermons too laden with his own geopolitical concerns. You might remember him as the guy whose endorsement for McCain made the news because of remarks he’d made about the Holocaust. When I stumbled across his broadcast the other night on my circuit through the channels, I found him talking about the founding of America. Thinking this would provide some entertainment, I stuck with it. It turned out to be your standard civil religion jeremiad. America is going down the tubes, we’ve forgotten our roots, etc. By way of illustration, Hagee ran through a list of men who signed the Declaration of Independence and later suffered devastation and ruin because of their support for the Revolution. If this rings a bell, it’s because it comes from a patriotic chain e-mail called “The Price They Paid” that usually makes the rounds on July 4. It’s mostly hogwash, riddled with the sort of errors that anybody with Internet access can debunk in a few minutes. Take, for example, the story of Thomas Nelson, Jr, member of the Continental Congress and commander of militia. In 1781 he succeeded Jefferson as governor of Virginia. 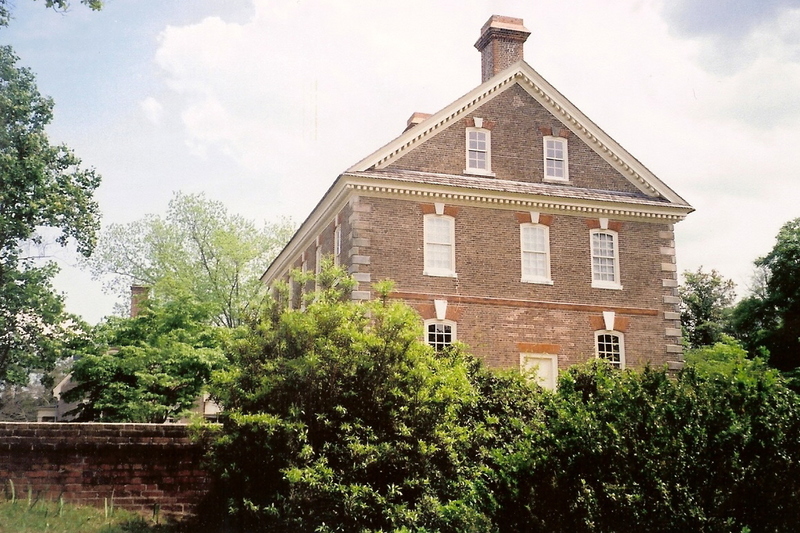 He owned a fine home in Yorktown, supposedly used as the headquarters of Cornwallis during the siege. According to “The Price They Paid,” and as repeated by Hagee, Nelson was aware that the British commander would have taken up residence in his house and requested French and/or American artillery to open fire on the building. The cannons demolished the house, and Nelson died broke. Note the big freaking house sitting on top of it. Nelson’s home is still there, and while it did indeed suffer cannon damage, there’s no evidence outside of tradition that Nelson himself ordered troops to fire on it. In fact, according to Jerome Greene’s highly detailed study of the siege, Cornwallis did not even use Nelson’s house as his headquarters. Instead, he set up shop in the home of Nelson’s sixty-five-year-old namesake uncle. Allied guns struck this home, too; Greene reports that cannon fire killed one of Nelson’s servants. Some versions of the legend maintain that it was this house to which Nelson directed fire, but again, it’s an unsubstantiated tradition. Personally, I think these myths actually trivialize the actions of the signers. They took real risks in publicly identifying themselves with an unlikely cause because they thought it was the right thing to do. Embellishing their stories implies that this wasn’t enough, that they weren’t real patriots until they lost everything they had because of their allegiance to the cause. It’s the willingness to risk that makes someone a hero, not the outcome. You’d think a guy like Hagee, who makes a fortune as a speaker and writer, could do better than a sappy chain e-mail for a sermon illustration. But if his congregation thinks they’re getting their money’s worth, then I guess they might as well have at it. Here are two over-generalizations that I’m sick to death of hearing. 1) People who become professional historians don’t live in the real world. They don’t have to deal with things like budgets, making payroll, paying suppliers, shuffling invoices, and all the other aspects of keeping an operation running that the rest of us learn to manage by our quick wits and the sweat of our brow. 2) Our choice as citizens is between historic sites and jobs. It’s, like, 2010, not 1860, and what we need are jobs, jobs, jobs. We need to stop worrying about maintaining historic sites and start worrying about getting people in our communities employed. The Foundation’s chairman notified me in the late autumn that it would be necessary to cut the Foundation’s contribution to our Park by some 62 percent in the fiscal year beginning Jan. 1, 2009. This meant an end to business as usual and severe steps would have to be taken to balance the budget during the coming year. I feel confident that although the percentages might vary, there are few employees, board members or supporters of private historic sites to whom this scenario seems foreign. During the last several years, virtually all of my colleagues working in public history have shared similar horror stories. As comforting as it was to know that we were not alone in this financial dilemma, there was little time for self-pity or mutual commiseration. We had to take immediate steps to ensure that adequate funds were available to meet our financial obligations and then develop a new fiscal model that would lead to mid- and long-term sustainability. The majority of most park and museum budgets pay for personnel. There is only so much that can be saved in utility and maintenance costs and the purchase of goods and services. We had no choice but to lay off more than half of our talented work force — an awful experience for everyone involved. Funny thing about historic sites: People actually work there, they generally prefer getting a regular paycheck, they pay state and local taxes out of those checks just like everybody else, and when the site takes a hit they might lose their jobs. Which means, you know, less of that “employment” thing that development apologists like so much. You can support Pamplin Historical Park during this difficult time with donations, by volunteering, or through their affiliation with the ShopforMuseums.com program.